Cherish the Love, and each other. We got this as a takeaway from a silver wedding we attended over the weekend. 25 years is no mean feat. It takes courage to get married. It takes greater commitment to stay that way. Yes, having a wonderful partner only makes the journey worthwhile. 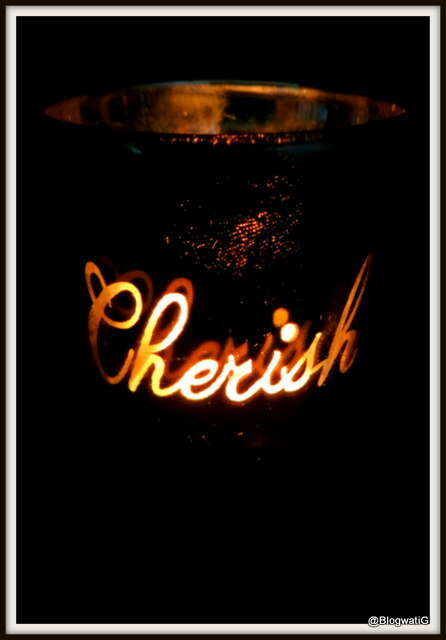 As I lit up a dark corner at home with the Tea Light, the words Cherish came to life. Truly, marriage is meant to Cherish the love and each other. The journey promises to be difficult, but you will have a hand to hold. And when you are looking at the sunset, you will know that you lived, happily. Here’s wishing the jubilee couple another 25 golden years and more.